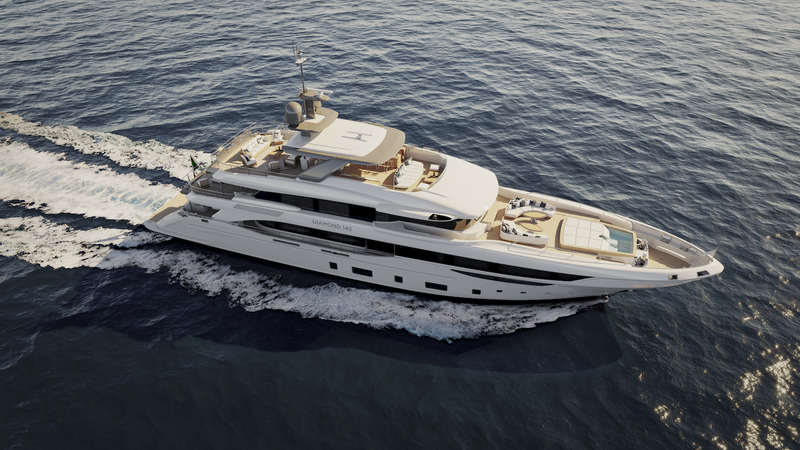 If you have any questions about the DIAMOND 145' information page below please contact us. 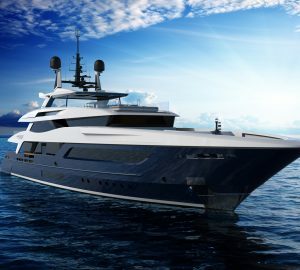 The DIAMOND 145' luxury yacht from Benetti belongs to the Italian brand's Classic line and features the exterior and interior styling of Giorgio M. Cassetta and Achille Salvagni respectively, bringing together timeless elements throughout the company's history with the very latest technology and trends. 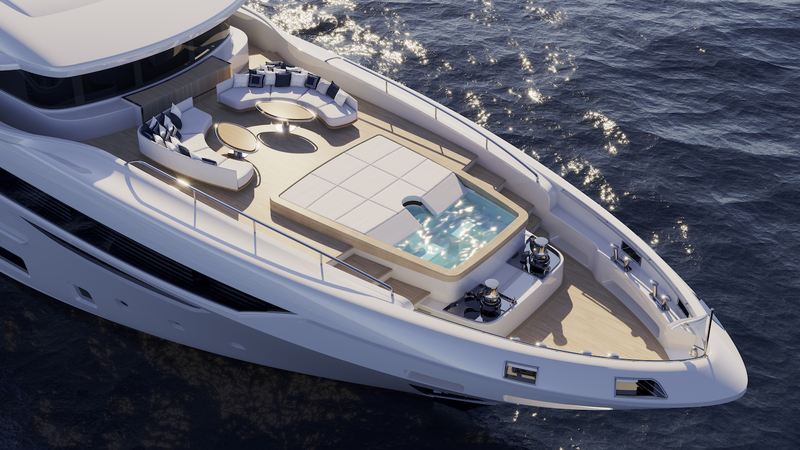 Spreading 44 metres, the yacht features accommodation that sleeps up to 10 guests over five large en-suite cabins, with the option to add another double en-suite cabin to the upper deck to accommodate 12 guests. A crew of 7 provides a professional and discreet service throughout the journey. The deep lower deck swim platform is an ideal extension to the beach club where guests can unwind in the sunshine close to the water. 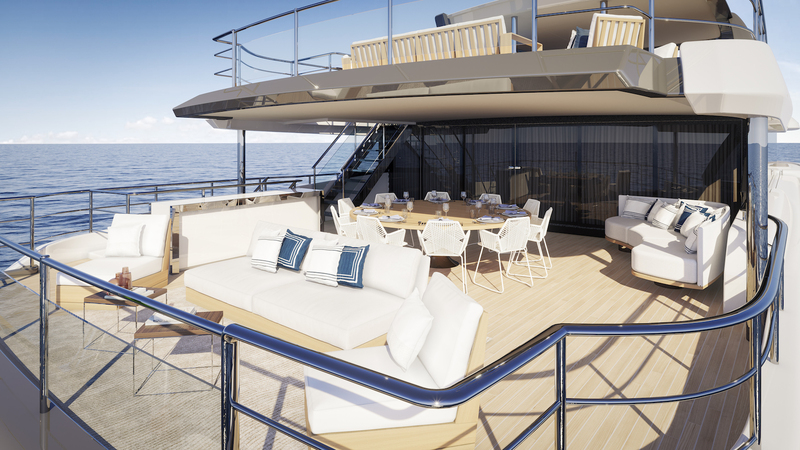 Two staircases lead up to the main deck aft where there is a sizeable sofa/sunbed lining the stern coupled with coffee tables and armchairs for a laid-back outdoor lounge. 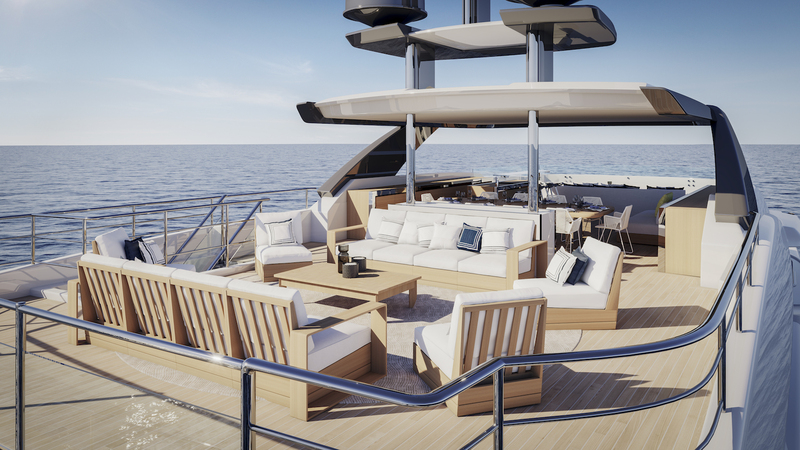 On the upper deck, the aft area is laid out with an elegant alfresco dining area under the shade with the outdoor lounge behind containing a port-side bar and plenty of plush sofas and armchairs positioned around a central coffee table. 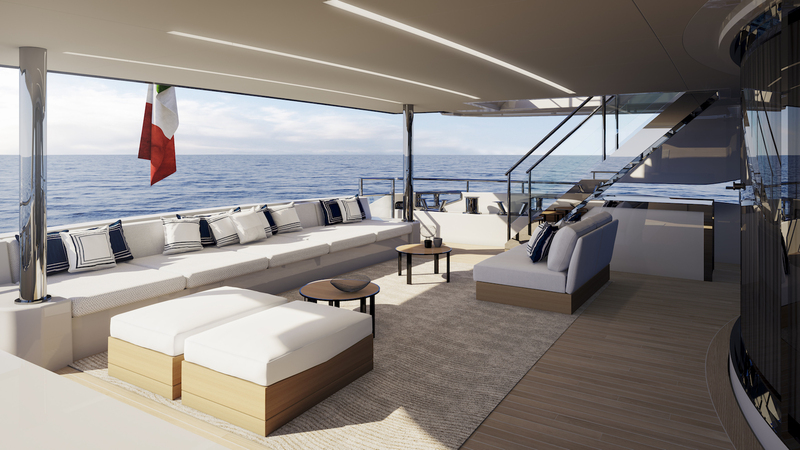 On the massive foredeck, two L-shaped sofas and oval tables enjoy uninterrupted views across the bow, while farther forward there is a massive sunbed with an incline that sinks into the forward spa pool. 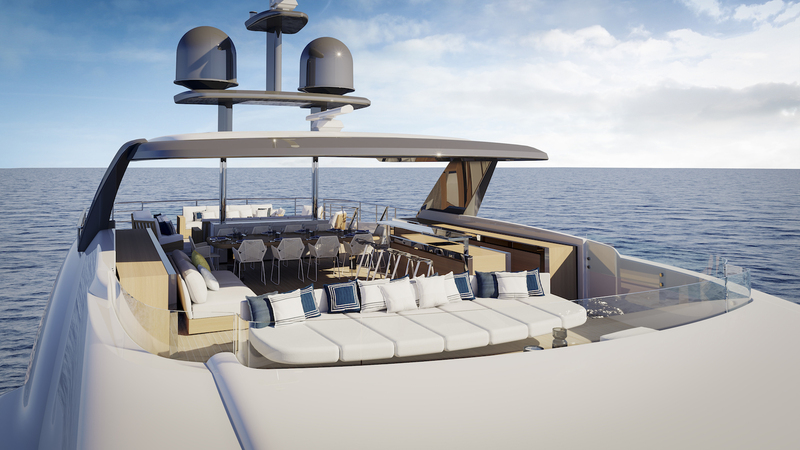 The sundeck can be customised as Owners desire and the model version places a large sunbed on the sundeck forward, leaving the room beneath the hardtop for alfresco dining, lounging in the shade and an aft bar that is conveniently placed close to the sizeable sun-exposed lounge on the sundeck aft. Captain's cabin directly behind. To the aft, the sky lounge features 80% glazing for magnificent views and a greater connection to the surroundings. Twin 1,400 HP MAN engines produce a top speed of 15 knots and while cruising at 11 knots she can achieve a range of 3,800 nautical miles. The accommodation provides for up to 10 guests over 5 beautifully-appointed en-suite cabins: 1 Master suite on the main deck forward and 4 double cabins on the lower deck. 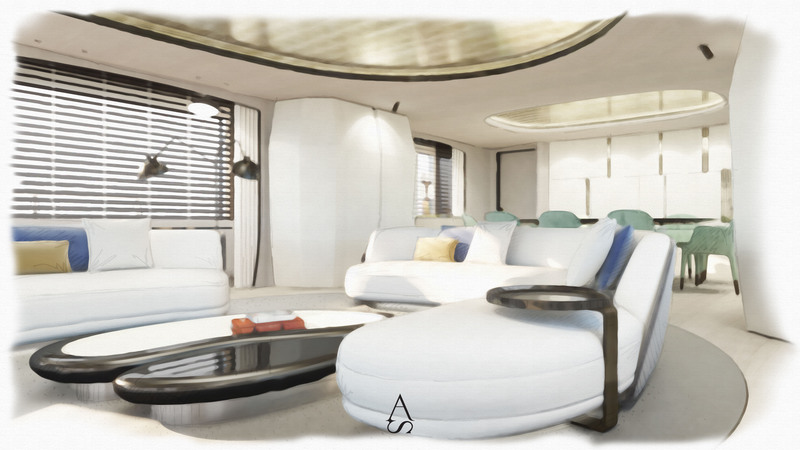 An option is available that allows a fifth double cabin to be placed upon the upper deck. We do have available further amenity, owner and price information for the 44.063 m (144'7'') yacht DIAMOND 145', so please enquire for more information. The luxury yacht DIAMOND 145' displayed on this page is merely informational and she is not necessarily available for yacht charter or for sale, nor is she represented or marketed in anyway by CharterWorld. This web page and the superyacht information contained herein is not contractual. All yacht specifications and informations are displayed in good faith but CharterWorld does not warrant or assume any legal liability or responsibility for the current accuracy, completeness, validity, or usefulness of any superyacht information and/or images displayed. All boat information is subject to change without prior notice and may not be current.